The Clean (As Possible) Comedy Show was the brainchild of Tony Vino, a Christian who’s been on the comedy circuit since 2006, and has already had three consecutive runs at the Edinburgh Festival. Along the way, it’s featured acts such as Greenbelt and Spring Harvest favourites Paul Kerensa, Andy Kind and James Dowdeswell plus Kev Orkian (Britain’s Got Talent semi-finalist 2010) and Pat Monaghan (winner of ITV’s Show Me The Funny). This February, the show went to Leicester Comedy Festival and is back in Edinburgh this August for a full run. Tony will be sharing MC duties with Andy Kind, author of Stand Up And Deliver and The Gig Delusion. Andy has been featured on BBC1, Channel 4 and ITV whilst both Andy and Tony have performed at all the major Christian Festivals. Tony is a well sought after act for high profile fundraising events for charities as Christian Aid, Oxfam, Fairtrade Foundation and TearFund. He was also the official warm up comedian for BBC Songs of Praise (tough crowd). Says MC Tony Vino, “Everyone seems to love the fact that it’s a show they can bring their kids and their Gran to ... as long as their Gran isn’t too potty-mouthed that is. All the acts have to follow our guidelines, which parallel those of a 12A certificate film. It’s a 4pm start at Edinburgh Methodist Church (named as Greenside @ Nicolson Square during the festival) and costs only £6 (£4 concessions). The show is an hour long and family tickets can purchased for £16. 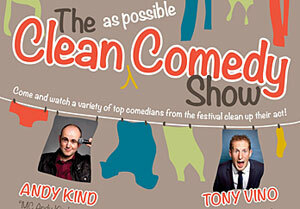 In a special competition, Inspire has a pair of tickets to give away to The Clean (As Possible) Comedy Show. All you have to do is email us with the name of one of Andy Kind's published books, and include your name and a phone number. Closing date for entries is Monday 21 July 9am – after that we'll pick a winner from all correct entries received and arrange with the organisers for you to pick your tickets up for your chosen performance.